Have you ever wondered what will happen to you when you die? Will you simply go into oblivion and cease to exist? Will you experience eternal bliss in heaven? Or will you suffer unimaginable anguish forever in hell? Most people have wondered about these questions, and great thinkers have tried to discover the answers. But frankly, no one can know the answers unless they are given or revealed to him. And the only One who can reveal them is God. He has determined the answers from eternity. While the Creation makes known that there is a God, the Bible is God’s complete and only revelation to man in this age concerning those things necessary for glorifying God in worship and for man’s salvation and faith. Although He used many people to write it, it is all the Word of God. The Bible reveals what will happen to you when you die. But it also reveals some other things you should understand first. This article is adapted and revised from The Word of His Grace radio program, "Repentance" that originally aired in 2005. 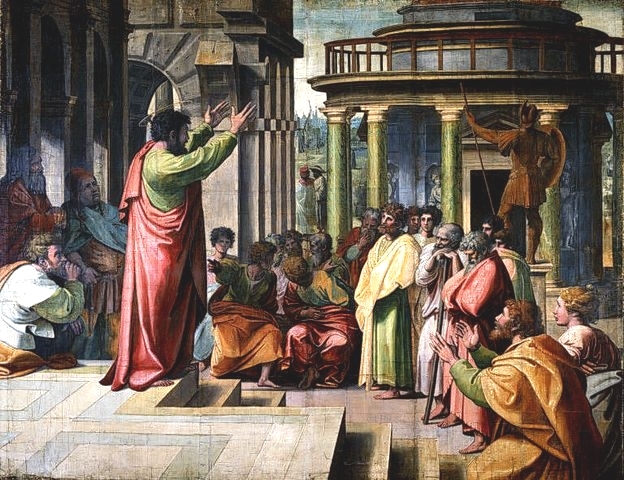 St. Paul Preaching in Athens by Raphael (1515). Paul boldly told the Athenians that God now commands all people everywhere to repent. There is Paul, facing the great minds of his day—the pagan philosophers of Greece. He is standing in one of the very centers of pagan thought, Athens. He is speaking to people who have never heard of Jesus Christ and know nothing of the true God. Greater skeptics one could hardly imagine. Does Paul weaken his message in order to reach these people? Does he say that we really all worship the same god, just with different names? Does he debate with them over their points of philosophy? Does he hire temple prostitutes to dance and sing (with Christian words, of course) to bring in the crowds? No. Emphatically, no! Oh, he uses an anecdote and a stunning opening statement to get their attention. But he never gets down on their level. He held the banner of Jesus Christ high. What Would Jesus Have Said in Response to the Terrorism of September 11? The shocking events of September 11, 2001, have stamped horrific images indelibly into our minds. But those airliners turned fireballs and towers atomizing their way to earth may also have altered the very course of human events in such a way as to plunge civilization instantly into an age of uncertainty or even chaos.